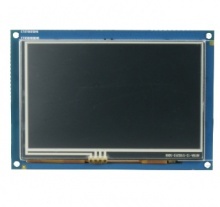 The ICnova ADB1004 is a ready to go touch display solution with ADB1004, 5inch display and ICnova SAM9G45 OEM. Just connect to power (e.g. USB) and see the Linux booting up in display! It works with ICnova AP7000 OEM, ICnova AP7000 OEMplus, ICnova i.MX353 OEM and ICnova SAM9G45 OEM. The ICnova ADB1004 can be ordered at our Shop. In order to utilize the interfaces of the ADBs a CPU module has to be mounted. The following table lists modules compatible with the ICnova ADB1004. All Modules provided by In-Circuit usally have a Buildroot based system preinstalled, so they can be used out of the box. Login as "root" for which no password is set. If you are new to kernel building please refer to First Steps with Buildroot. The board support packages for the modules on the ICnova ADB1004 can be found on the modules page. Generally the bootloaders on our modules are configured to loook for a bootable linux image on the SD-Card and only boot from flash if none are found. This page was last modified on 28 March 2017, at 12:02. This page has been accessed 13,162 times.